Today is the first day of summer, the day before my school’s fashion show…and it’s my birthday! It’s been a great week…earlier this week we had an enormous increase of people viewing the Thread Theory website which was really exciting. Also, Louisa of Damselfly’s Delights sent us photos and a report on her newly completed Newcastle Cardigan. It is so exciting to see such a successful version of our pattern! stylish his new jacket is! That is a profound compliment coming from him. 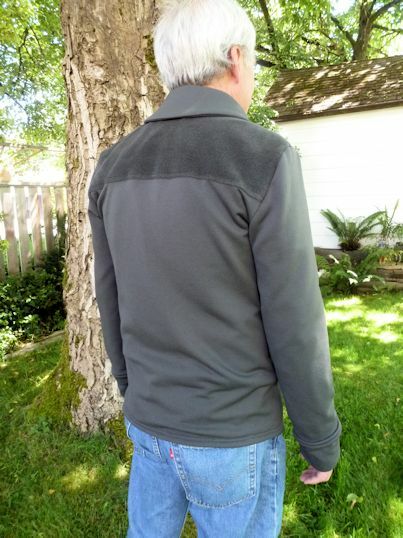 Louisa very kindly sent us and posted a detailed review of our pattern with some intriguing suggestions on how to improve the sewing experience for beginners (we could offer a zipper and binding option to replace the need for facings…what an awesome idea!). If a zippered version looked something like this, I think it would be very stylish! With only a day left of school commitments I am eagerly planning to add these adjustments and will let everyone know when they are uploaded…and of course, anyone who would like the revised version and has already purchased the pattern can simply email (info@threadtheory.ca) to receive their copy! Stay tuned! I have added Louisa’s photos to our Newcastle Slideshow. 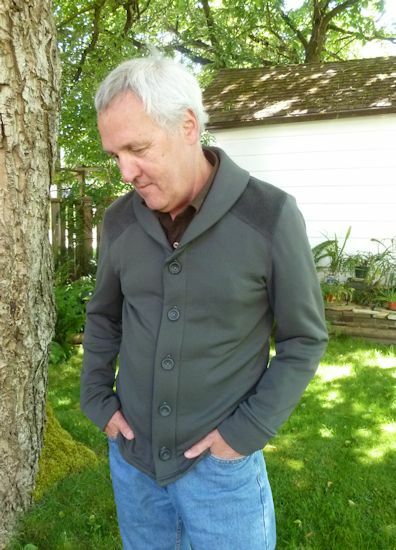 We look forward to receiving more emails as the finished cardigans start popping up throughout the internet sewing world! At school this week, every day has been complete chaos in the fashion department. Matt came into the school on Monday to help me with the photo shoot (isn’t the shot he took of my coat with fur collar pretty?) and witnessed the general panic and confusion as the fashion show draws nearer and nearer (it’s TOMORROW!). There have been people crying, models changing in all corners of the building, fabric piles being spread high and low in the sewing room, and a steady feeling of jittery excitement at all hours throughout the week. I’ve been chugging through my to do list and only have a pair of leggings and some hook and eyes left to sew today. 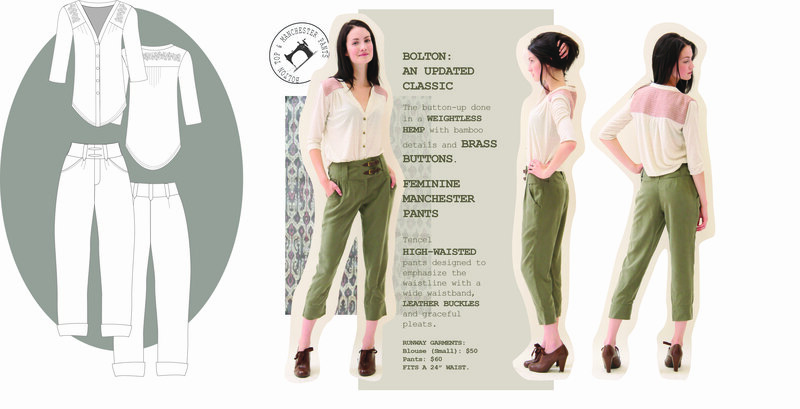 A couple days ago I finished off my ‘lookbook’ featuring my collection’s designs and I even included prices for the runway sample garments in case anyone at the show or online are interested in purchasing my designs 🙂 In fact, Kendra, the beautiful model in the pictures, has already staked her claim on the green tencel pants! If anyone is interested in receiving a PDF of the lookbook to see my pricing or just to have a browse (is this just wishful thinking? It’s worth a shot! ), send me an email (info@threadtheory.ca)! 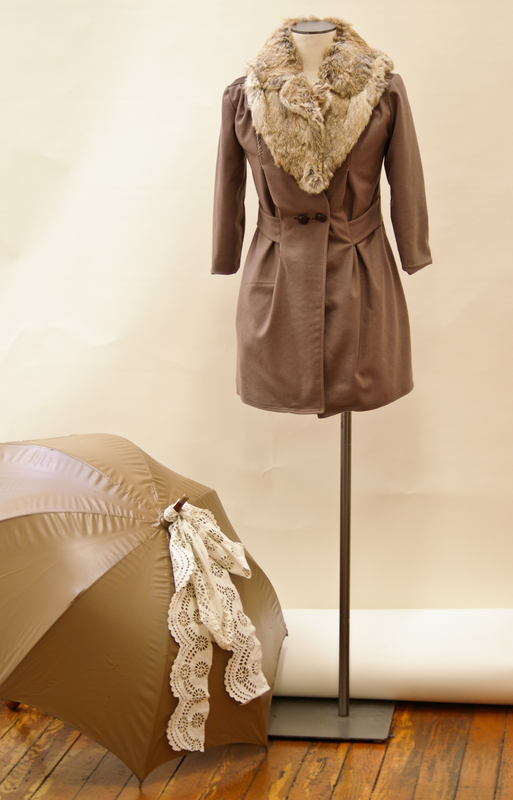 Categories: Friday Posts, newcastle cardigan | Tags: Pacific Design Academy | Permalink. Belated Happy Birthday. The Newcastle does look particularly stylish in that first photo. Sounds like Thom will be receiving more sewn garments in the future. Lucky guy! Happy Birthday! I am definitely going to make a Newcastle for my DH! happy birthday, and good luck! i am so in love with the pant/blouse outfit. Ooh, a zipper option would be great! Happy birthday and good luck! Happy Birthday Morgan! Good Luck at the show-I will see you there! happy birthday and good luck with the fashion show! 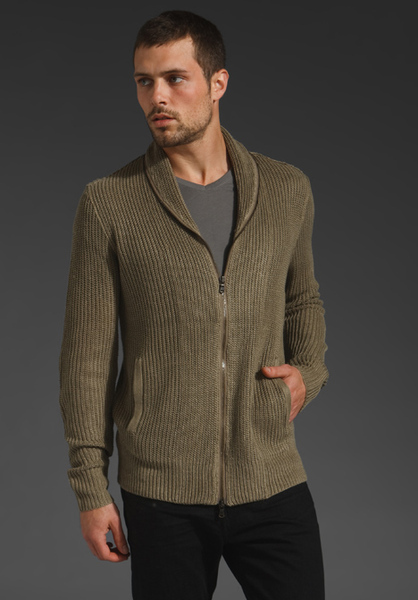 Really love this version of the Newcastle Cardigan. thanks for sharing! Happy birthday and good luck with the fashion show. Happy Birthday! And Happy Fashion Show! I look forward to attempting a Newcastle zipper version. Good luck tomorrow.